Welcome to our state-of-the-art website! We're excited about what Iwa can now offer you and the rest of the world through our website. We hope you'll take some time to look around and see what we've got. We will be putting up new things frequently, so keep coming back and checking out what's "New and Noteworthy" on this page. And please give us feedback below on what you think. 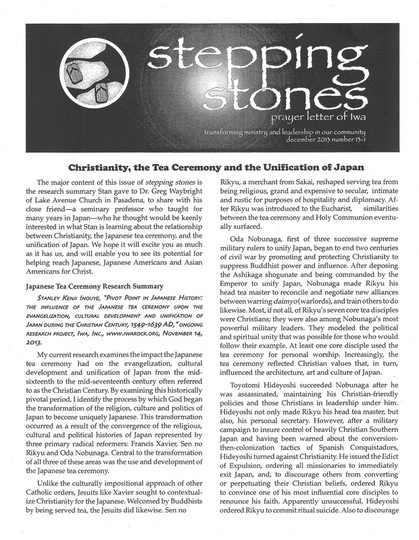 Since returning from Japan several weeks ago, all that I learned over the past decade about the relationship between Christianity, the early development of the Japanese tea ceremony and the unification of Japan during the Christian Century is being transformed from an abstract construct of linked historical facts, to becoming a concrete and coherent experiential reality for me. 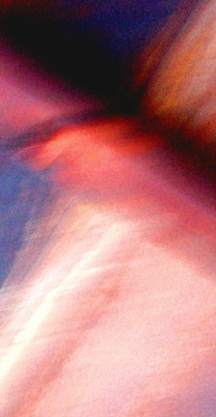 This resulted because I saw and experienced for myself the aftermath of something that miraculously and then catastrophically occurred in Japan because, I believe, Japanese Christians created and conducted the Japanese tea ceremony in such a way that it helped hundreds of thousands of Japanese become Christians in less than a century who were later willing to die rather than deny their faith in Jesus. This bold assertion about the role of Japanese Christians in the early development of the Japanese tea ceremony is radically different from traditional beliefs about its origin. That is why it took me a decade of research to be willing to come to a conclusion that flies in the face of the views of most historians. The reason for the discrepancy is based upon the same reason my wife, who grew up in the Midwest, never heard about the internment of Japanese Americans during World War II until she was in college. Just as the United States tried to whitewash American history by not including the internment in history books, Japan did everything it could to remove the influence and impact of Christianity from its history and transform its view of the Japanese tea ceremony to being based solely on Buddhist, Shinto and Confucian roots. While I have all the historical information needed to provide a solid argument that my position is valid, I have been encouraged to document and share my historical research at a later time so that I can move on to explore how the Japanese tea ceremony was actually able to help bring, for better or worse, unity to a nation who had been in constant civil war for two centuries and, more importantly, help hundreds of thousands of Japanese become Christians in less than a century. For this reason, I have been taking lessons in how to perform the tea ceremony, collecting the tea bowls and accessories necessary to host the tea ceremony, and working to transform the entire landscape at our home into a place where the Japanese tea ceremony can appropriately take place. Consistent with this direction, my wife, Janie, and I went to Japan to specifically explore the sites significant to the early development of the Japanese tea ceremony, the political and religious impact it had on the nation, and the devastation that resulted when Christianity was prohibited in Japan and Japanese Christians were massively mutilated and martyred as a consequence. On our first day in Japan, Janie and I, together with a new friend we had just met, had the wonderful opportunity to participate in a half-day workshop that enabled us to experience every major aspect of a formal Japanese tea ceremony. We stepped off a busy street in Osaka through a massive Japanese gate and entered the quiet serenity of a beautiful tea garden surrounded by thick sound- insulating walls. Much of our time and resources at Iwa have been spent recently on developing our God Man resources: a study series, a poem, and a DVD that introduce people to Jesus Christ in a way that will make him feel alive, real, and knowable today. Please check them out ﻿h﻿er﻿e﻿. "And we know that in all things God works for the good of those who love him, who[a] have been called according to his purpose." Romans 8:28 is familiar to many of us. I often quote this passage to myself when something seemingly bad happens to me or when things don’t turn out as well as I had hoped. As a Japanese American, it is my “go-to” shikataganai verse. It is my way of rationalizing what I view as a negative situation with my belief in the love and sovereignty of God. In essence I am reminding myself, “Oh well! I guess it can’t be helped. If God is in control, I guess everything eventually will turn out O.K. !” To me, this verse has been more of an afterthought than an expectation or promise. However, God has been revealing to me how He has indeed been working, throughout my life, and especially now, so that what I have so often thought of as competing and discordant strands in my life are being woven into one wondrous tapestry steadily inching its way closer to completion. multitude of ways to fulfill our mission from the Lord. Little did I expect that our journey would lead us so convincingly and definitively to the Japanese tea ceremony. and the Japanese Tea Ceremony? Iwa President and Founder Stan Inouye spent a great deal of his time over the past year-and-a-half investigating something he had heard about, was fascinated by, but had only gotten bits and pieces of information about--the re﻿lationship between Christianity and the Japanese tea cere﻿mony. As he delved into his investigation, to his amazement, Stan found far more than he could have possibly imagined when he started. Not only did he find strong evidence that Christianity had an influence on the shaping of the Japanese tea ceremony, but he also found reliable support for the contention that Christianity had an impact on the unification of Japan. It was the tea ceremony—influenced by Christianity and performed by tea masters who professed Christian faith or were otherwise influenced by Christianity—that the unifiers used to bring warring parties together and bring about the cessation of hostilities, and peace. It was a kairos moment when three major streams of influence in Japan converged--Christianity (religious), the tea ceremony (cultural), and military conquest to unite feudal Japan (political)—and put Japan on the road to becoming the nation it is today. The bold, brush-painted Chinese character, or “kanji,” that graces Iwa’s home page, as well other web pages, is not just a visually stunning piece of calligraphic art. 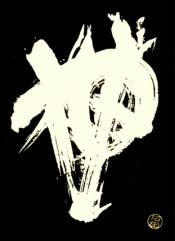 It is also a symbol that has special meaning to Iwa, especially in this phase of Iwa’s ministry in which “The God Man” seems to be the defining theme. It's not every day that Iwa receives accolades for its ministry resources from high profile Christians leaders. So one recent enthusiastic endorsement of Iwa's God Man poem by the pastor of a very large local congregation got Iwa's attention and has caused the staff to think that God is up to something that no one could have possibly foreseen. I just finished leading an eight-week Sunday morning Bible study at my home church—Gardena Valley Baptist (GVBC)—using Iwa’s God M﻿an series materials, and I’m very pleased with how well it went. 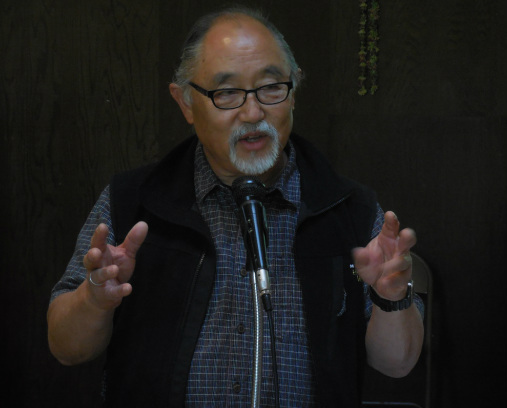 ﻿Please give us yo﻿﻿﻿﻿ur fee﻿dback about our website and any suggestions you may have as to what we at Iwa mig﻿ht do to enable you to more effectively share your faith with Japanese Americans and others of Asian anc﻿estry here in the United States. Our deepest heartfelt burden, along with yours, is that they too can come to know who Jesus is more fully, enter into relationship with him, and grow in that relationship. You may be prompted by the Lord at this time to donate to Iwa. You may do so online using your credit card through PayPal by pressing the Do﻿nate button below or go to Donate on the main menu for further information and options listed on the pull down menu beneath it.